← The Best Santa Letter Book Ever! Posted on January 14, 2014, in Apologies, For Dads, For Moms, Notes, School Confessionals and tagged children writing, confessionals, funny, funny kids writing, hand-written notes, Humor, notes, parenting, preschool, Stuff Kids Write, writing on cars. Bookmark the permalink. 12 Comments. I’ve wanted to do that before. I think we’ve all wanted to do that before. LOL. straight to the point! I look forward to the next!! HAHAHA. Oh Max. That poor kid must have one heck of a head ache. Oh the guilt…ha ha! Great share thanks! The brutal honesty of children is something that amazes me to this day. As a mother of a 3 year old and an 18 month old, I’m still floored by some of the stuff they say. thats something my little brother would do….hilarious, since i work at the boys and girls club as well! 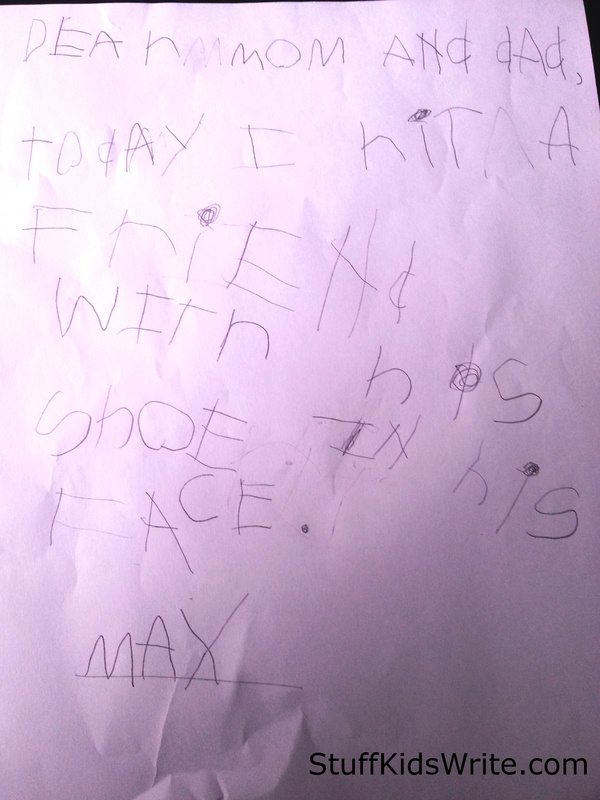 I am so glad I found this blog, “Stuff Kids Write”! After a long night at work, it was a pleasure stumbling across this and getting some good laughs in! All the santa clause letters, school lists, and of course Max’s confession was absolutely great! Thanks for posting all these and I am definitely going to keep up with this blog!